You have sensitive data to protect? There is only one reliable way – encryption, and it is not as hard as you might think. If you are looking for quality encryption software, which you could use without being a crypto expert, then Kryptel is what you need. Kryptel is available in several editions to fit every possible requirement and budget – from free Kryptelite to advanced Enterprise Edition. Encryption may be a complex thing, but you don’t need to be a rocket scientist to use it. 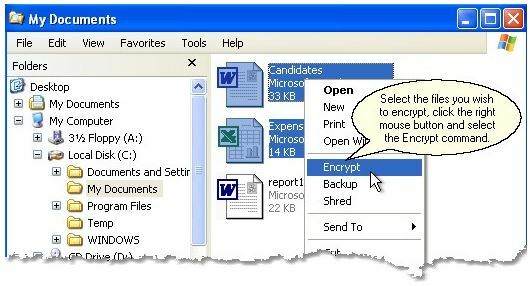 Just right-click a file or a folder and select ‘Encrypt’ – or drag it to the Kryptel desktop icon. 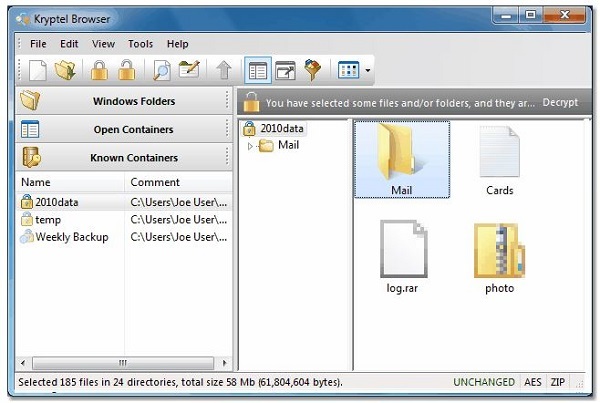 Kryptel produces not just an “encrypted file”; its files are containers that may contain thousand of files and folders. Sometimes you might want to decrypt a few files only, or just peek inside. Kryptel Browser is an Explorer-like tool, which lets you easily browse or modify a Kryptel container and view the files it contains. Nobody encrypts useless data, and Kryptel makes every possible effort to ensure the important user files are safe. Even if the computer crashes in the middle of encryption step, no data will be lost. To make encryption even more reliable, Kryptel performs a verification step after every operation to guarantee that the just created encrypted container can be successfully decrypted. And if an encrypted container becomes corrupted due to hardware failure, Kryptel Data Recovery gives you a good chance to get your data back. Strong encryption is the only way to secure data, and this is exactly what Kryptel provides. It implements the latest NIST-approved Advanced Encryption Standard; several more well-reputed ciphers are also available for advanced users. And of course, there is no “backdoor” or “master key”! Kryptel can work in FIPS 140-2 compliant mode, using FIPS-validated CryptoAPI encryption engine. Encrypting a file or a folder is often all what is needed, but Kryptel can do a lot more. For example, you can instruct Kryptel to scan your hard drive and encrypt every MS Word file it finds. And what’s more, you encrypt the whole set of files with just a single mouse click! Encrypted backups is another nice Kryptel feature for safe data storage. Thanks to strong encryption, Kryptel backup files can be stored anywhere – burned to a DVD, moved to LAN storage, or even sent to a remote public server. A tiny typing error in the encryption password can lead to hours of frustrating guessing game. The Kryptel’s state-of-art password dialog simplifies password entering and makes typing errors less likely to happen. Everything that you can do with your mouse, you can do using the command-line interface. Kryptel fully supports batch mode encryption, including server-side processing with no desktop available. Kryptel supports portable installation and can be run from a flash stick or a USB hard drive. You can take Kryptel with you anywhere!